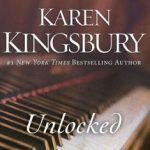 Book Review: ‘Unlocked’ by Karen Kingsbury - Word Matters! Have you ever known someone who is locked in their own inner world? Unlocked by Karen Kingsbury is a book about a boy named Holden, who develops Autism at the age of three. His mother believes that the shots he was required to receive before entering pre-school are the cause of his disability. When the book first starts, Holden is locked in his own world, filled with memories of himself and his friend singing and dancing. He must use flashcards with specific words on them to communicate with his mother and others around him, due to the fact that he cannot talk at first. He keeps his flashcards in his backpack and pulls them out, flipping through them in rapid succession until he finds the one he wants. Even though he is bullied, he finds his long-lost friend, Ellie, by wandering into the drama class. His teacher thinks that he is disruptive, but his mother makes an astounding discovery. He and his cousin Kate are watching the film he loves to watch, featuring himself and Ellie when they were three. As they watch, Tracy catches him dancing in circles with Kate. This leads to his finding Ellie in her drama class and her request to have Holden sit in on the rehearsals, then finally getting the part of the prince. As Holden observes Ellie in her class, he starts to sing again after nearly fifteen years of total silence. As their friendship is rekindled, Tracy gets in touch with Ellie’s mom and dad, and they renew their friendship once again. One other surprising aspect of the story that comes to life is the fact that Holden begins to talk with his family, his mom, and especially his dad, who has lived and worked in Alaska for most of Holden’s life. I don’t want to give away too many more spoilers, but I can tell you, I had a hard time putting this book down. There is a deep message within these pages, and this gripping story will touch your heart and possibly unlock something deep inside you. I love Karen Kingsbury’s books, as a whole, and when this book and the fiction movie for it was mentioned in the Above the Line series, where Bailey Flanagan starred as Ellie, I was very pleased by the novel that Karen wrote as a follow up to the mention of the fiction movie. I have wanted to read this book for years, and I must say, it inspired me to write an article about the connection between music and blindness, and music and autism. Stay tuned for this upcoming article.